Factorie, the Aussie street fashion brand is offering 30% off your next purchase when customers spend $50* (Singapore) on full priced merchandise - just in time for the Lunar New Year! *In one transaction. Valid from Monday 25th January – 21st February 2016. 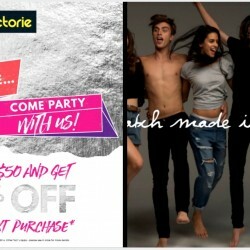 Receipt of $50 or more purchase must be shown at time of redemption to fulfil order. Other T&Cs apply.